Australian angler Ryan ended his Thailand fishing holiday with a day predator fishing at IT Lake Monsters. The angler began lure fishing for the many predators as was soon rewarded with several Alligator Gar and Pacu in the following hours. After a brief rest for lunch Ryan cast out a deadbait to a quiet area close to the bank. Almost immediately he received a high speed take as a large Redtail Catfish exited the swim. Continued pressure soon saw the fish brought to the net. The Redtail Catfish was estimated to weigh 30kg and released after photography. The afternoon continued in much the same way with Redtail Catfish continually homing in on the anglers deadbaits. Ryan added several other species to his rapidly increasing tally with Asian Redtail Catfish and Pacu also making an appearance. 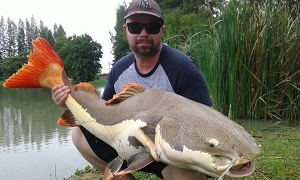 Redtail Catfish were the most prominent species of the day by far seeing Ryan land almost twenty fish upto the 40kg bracket.